It’s that time of year. Three years and three days ago we were robbed of being with each other physically on earth together. But really we have never missed being with each other, have we? I must admit i loved to fluff up your long thick hair and kiss your long nose, but when I kiss Joy’s nose it’s just like yours. You Border Collies have that certain something – a cuddle factor unmatched by any other breed of dog child. So we wrote the book together and just recently I was in Chicago and a girl who I had not seen in a long time, asked me to sign her copy. That was nice. You are everywhere, even when I travel. Today it’s Halloween. The weather was too rainy to get to the park, but it’s supposed to snow tomorrow, so even if it’s yucky, Joy and I will drive over to the park to see the snow there. 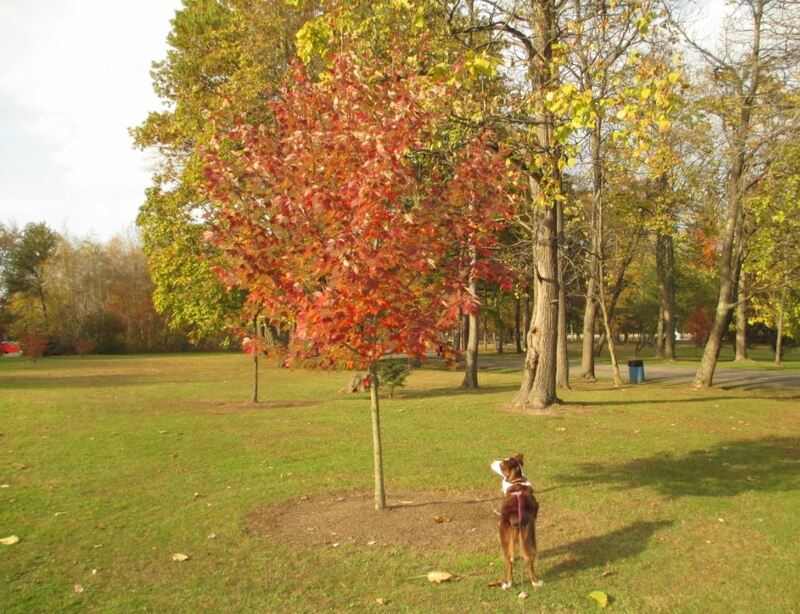 I’m sure all your leaves will be gone by now. 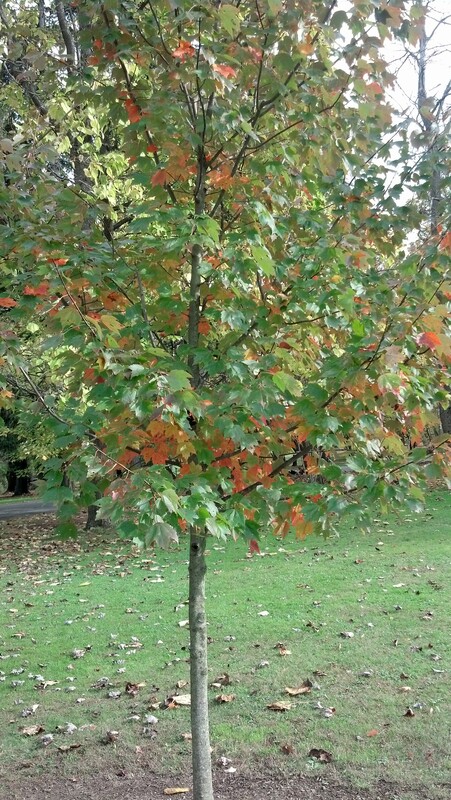 Several days ago when I took these pictures of your tree at Buhl park, it was a gorgeous day, with air so crisp like a Winesap apple. 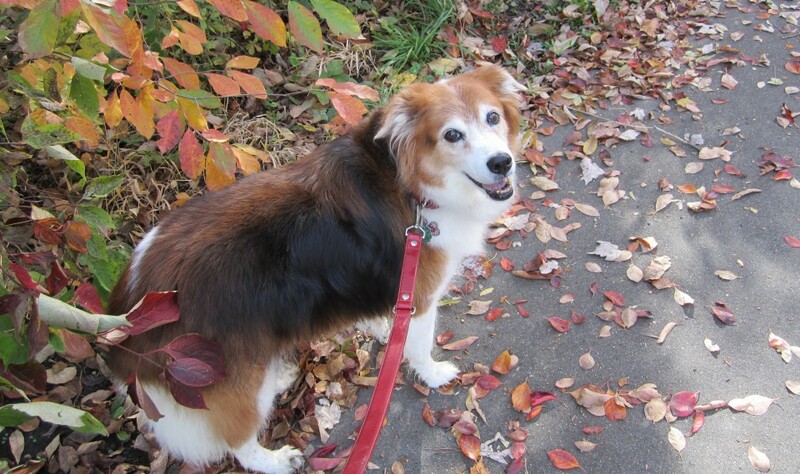 Joy was having so much fun crunching in the colorful leaves she turned around twice just to jump up on me and kiss me as though she were thanking me – in fact I know she was- she was so happy to be there on such a nice day! Before we left Pennsylvania, Joy and I visited your tree many times. I took these pictures on the last day we went and your tree is beautiful and growing so tall. Look at how Joy is looking up at it in admiration! 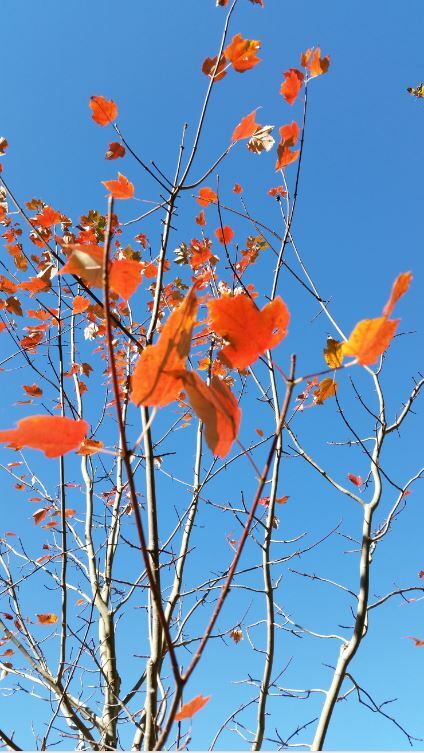 I am so thankful for the tree that was planted in your memory. I don’t know why I feel more of an affinity for this place in the park than your actual “special spot” in our backyard. 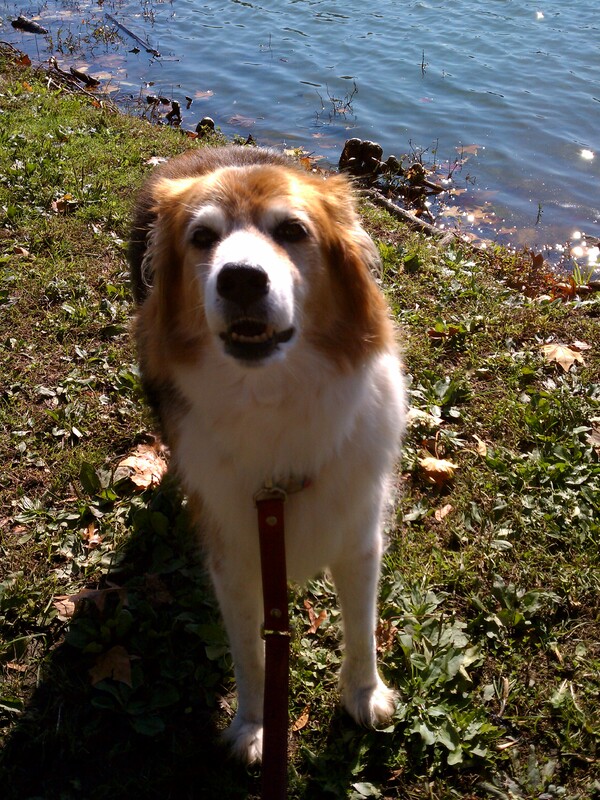 I think it is because you loved being at Buhl Park so much and we walked there so often. I also think of you being free within the landscape of this beautiful park filled with trees, flora, foliage and wildlife. With Thanksgiving coming up I always remember you telling me how thankful you were for us adopting you as senior and giving you a better life than you ever imagined you could have. I can tell you it was our pleasure. I also recall telling you how thankful I was for www.petfinder.com which allowed me to find you. I love Petfinder and I could not love you more. I wear my ruby necklace that Russell had made in your honor and I see it everyday in the mirror, just as I see your reflection in everything that I do and I too am grateful always for your love. With those thoughts I think of thanksgiving and its true meaning for me. As Tania likes to say, I love you with my whole heart. And my whole being. 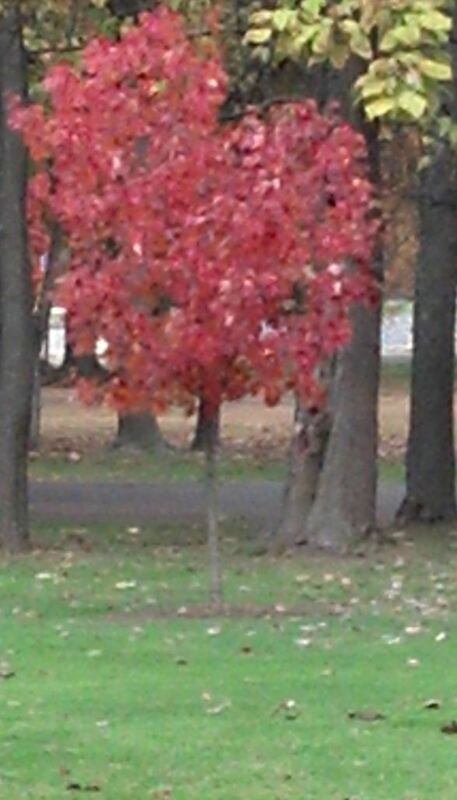 Your tree in Buhl Park looks so beautiful this third week of October, 2013. 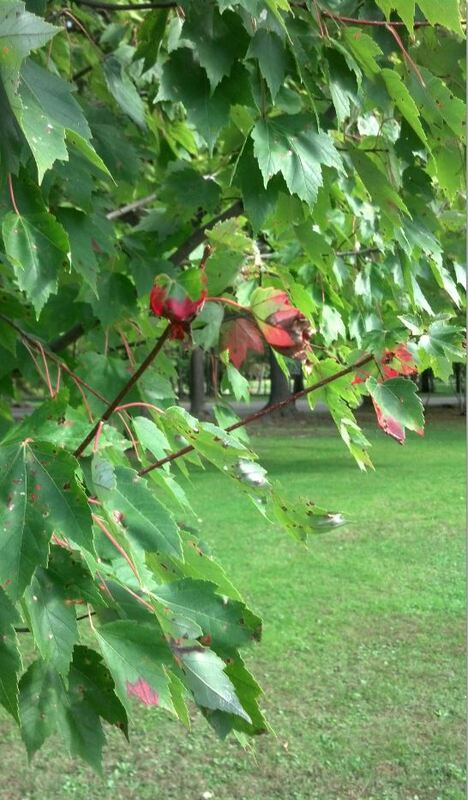 It has started to blush more frequently with its beautiful Red Maple leaves. Red of course was your color, although you always looked brilliant and all colors became you. I think of you everyday of course, but the 28th is the second anniversary of you leaving us for over the Rainbow Bridge and not a day goes by that you are not with me. You know that and I just had to tell you. Joy reminds me SO much of you except you had no fear of people like she still does of some. I am sure she knows how to sniff out the ones I do not like anyway. She is such a little lover girl and is very happy with her life. Like you, she has the great life that you left behind, but I know you are having lots of fun with Tarzan, Cheetah, Freedom, Anwen and all your pals and students that love you so much in Hyfryd. I meant to ask you something. Has Molly found you all? I wished a special thought that she would find her way to your neighborhood. I know if she did you have welcomed her to the pack. John and Tracy miss her and so do I – somehow it is not the same without her barking next door when she sees us pull into our driveway. I always liked that she said hello. Please let me know about her okay? It makes me very proud that we finished the book, but it really is a continuing story and it will never end, really. Love is infinite and so are you. On my mind, in my heart and in my soul. I love you Sweet Bailey. Write me soon. Buhl Day Can Be Any Day…. Today is Buhl Day, one of my favorite activities of the year and it was certainly one of yours, of course. We will see how Joy does with all the many people who come out to hear the music, eat the food and simply enjoy a celebration of a park that is steeped in history. http://www.buhlfarmpark.com/bfp/buhl-legacy/ which includes the fact that Frank and Julia Buhl never had children, but instead make a lasting and loving commitment to their community by donating their farm estate to the town of Sharon, PA. It is because of them that I was able to spend so much time walking in the park with you and of course Joy, your spirit sister. Buhl Day means a grilled hamburger for Joy and she will be so excited just like you were to gobble it up!. Many dogs will be there to enjoy this special day. This picture of you is right next to Lake Julia. I think I have 1000 pictures of you at Buhl Park. It’s such an amazing place and I feel lucky to be able to spend time there, exercising, walking and taking in its beauty. Like the Buhl’s, not all families are “traditional.” Your Papa and I might not have had non-pawed children, together, but he sure enjoys the furry ones we have devoted our lives to helping and taking care of. We of course will visit you tree as I do numerous times a week on our walks. It’s growing so big in just three years. Yes, it’s almost 3 years since I have been able to stroke your big mane and play with your fluffy tail. I know you miss me too. So far everyone who has read our book, Letters to Each Other, has loved it and we have had some great reviews – all five stars! http://tinyurl.com/mwkjn22. I just wanted to tell you that I am thinking of you strongly today. I am wearing your Ruby earrings Papa gave me, which matches the necklace that stays on always. You are always with me and always will be, especially in Buhl Park. Even though today is “Buhl Day” I really think everyday is Buhl Day when I walk with you in my heart. You blushed in full bloom. 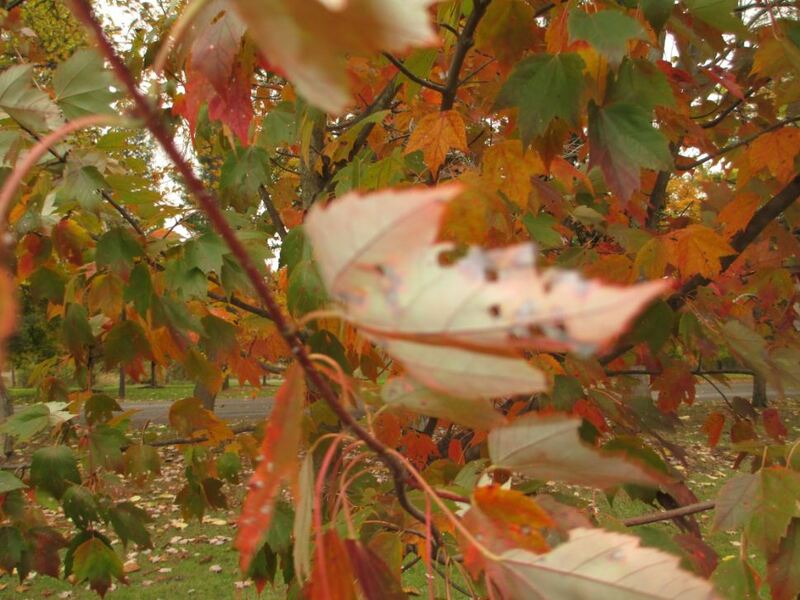 You are a stand-out amongst the hundreds of other trees at Buhl Park, so red and full like a woman’s lips searching for a kiss. And who kissed you more than me? Today is October 21 and week from now will be one year since you went to Hyfryd and it seems so much longer. So much longer, yet I am so proud of all you have taught me and all you continue to do there. Our spirits are so aligned and I feel you everywhere. Russell talks about you all the time and you know I talk to Joy & Safari about you everyday. To be honest I still feel sad some days when I think about how much I miss you. That is how I am. n Cheetah and Freedom and Lucky are always at the top of my mind. Sharing your life with an animal companion is very special because of its very nature and relationship. There is nothing else like it and it is different from humans. Animals of all kinds love without condition – something that some humans have not learned to do with each other. There is just a special sweetness that is unbridled. I know so many people like us too who feel compelled to be part of an animal’ s life, be it a dog or cat, horse or bird. It’s simply part of who you are or not but I am glad I=it’s always been part of me and when we met you became entwined into my soul as I have with you. Joy reminds me of you in a lot of ways but she truly is a puppy. She is still discovering the world and she has much to learn. She is a lot of fun and she literally makes all of us laugh everyday. Safari and her play so sweetly and truly like each other a lot. I have to say my working girl, you certainly kept your promise and found us the perfect girl for all of us. She will never take your place, please know that. She simply has her own and thanks to you – with help from Victoria – she found her way here, where she belongs. I just wanted to say hello after seeing your tree today. I wanted to say I love you, I am with you and thinking of you daily. Your pictures are in front of me and your spirit surrounds us. I was looking at a big scrapbook I made for you and began crying the other day. This picture takes up one whole page. Do you remember it? It was taken by Photographer Rich Cancio at the Angels for Animals Doggy Days Reunion in 2009 when you were healthy and well, about one year after we adopted you from there. I am not a huge fan of “portraits,” but I love this one because I look so happy holding you and you look so regal like you always did. Rich had donated his servces that day, which made me immediately like him. 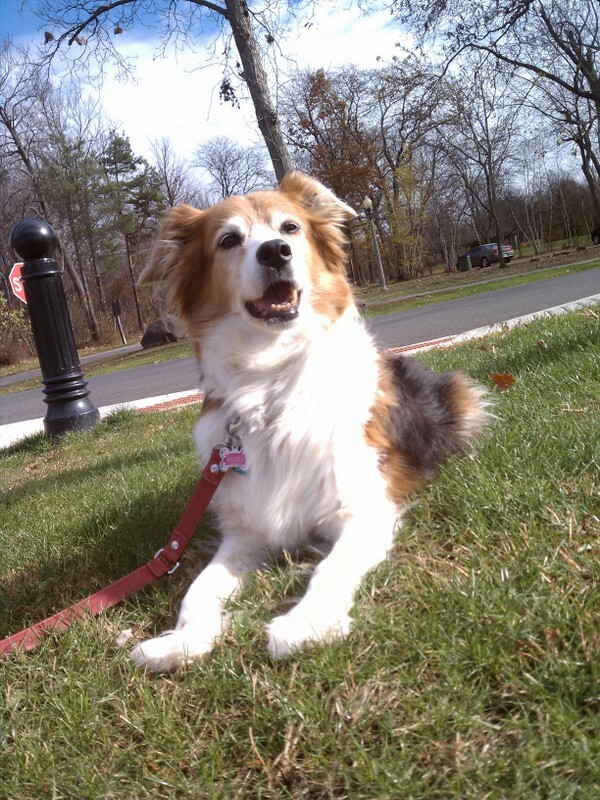 I love how you won’t look at the camera but posed like a pretty girl…. You were my photographic muse and I have at least a 1000 pictures of you if I have one! I know your den in Hyfryd is covered in pictures too. Recently, Rich contacted me on Facebook about a benefit dance he was involved with to help with the needs of breast cancer patients, something that his wife, unfortunately had to deal with. So I was thinking about cancer and how I felt when they told me about your bladder. No one wants to hear that and we all deal with news like that differently. We are always happy to support causes we believe in, so we bought tickets immediately. October is breast cancer awareness month. Pink things are everywhere – you know that is my color! I remember when Cheetah was near the end of her wonderfully long life, I used to say she was my soul, Tarzan, my heart and Freedom my spirit. I always thought you were a lot like Cheetah because you loved everyone and you had a true love of life. I can understand why you chose Joy for us. She embodies all those characteristics that I love and don’t you find it so ironic that her name was Joy? I mean, you really went all out to make sure that we got our Joy back – literally and we are so grateful to you for that. I miss you each and every day but you are always there in so many things that happen. 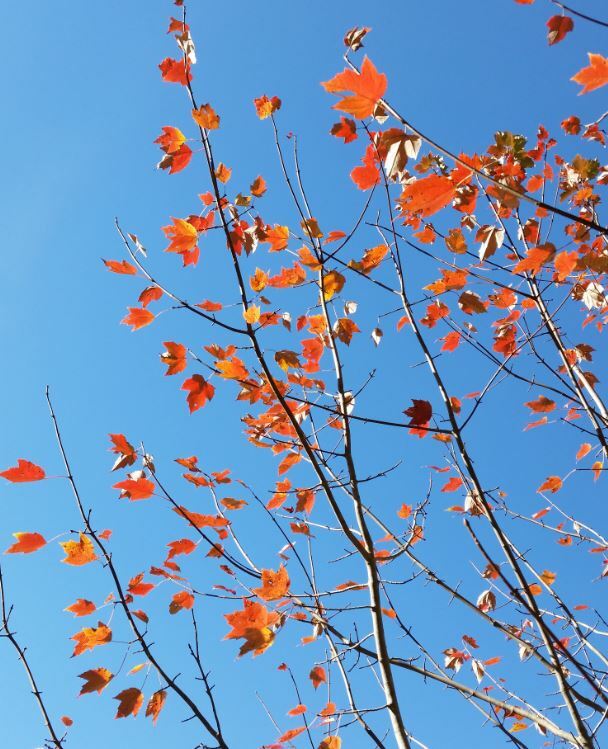 Your Red Maple has grown so large in just a year and as the Fall slowly sets in, the tips of the leaves have recently started to turn red – your color! But you knew that already. You are red and I am pink and pink is clearly a derivative of red. Of course that makes so much sense. We are of each other, mind and spirit -no matter where we are physically we will never be without each other. We love you, Bailey. When You Strive For the Best…. WOOF! I have been so busy, I am late with my letter. Onwen said to me last night, “you had better get your letter posted to mommy! He calls you mommy too. He feels like he knows you. If you would meet him, you would love him so much. He picked this picture of us to send this time. He was looking at it in my den and we started stalking about how lucky I was to have the best mommy and in our conversation we spoke of how people like us always strive for the best. Onwen is very much like me only in boy form! He likes everything so-so. We were talking in our classes about deserving the best even if the best had not been the experience of someone’s life. There is this sweet Standard Poodle, named Cuddles in my new class and she is a good example of what I mean. Cuddles told me that she came from a home of 3 dogs and she was the oldest. 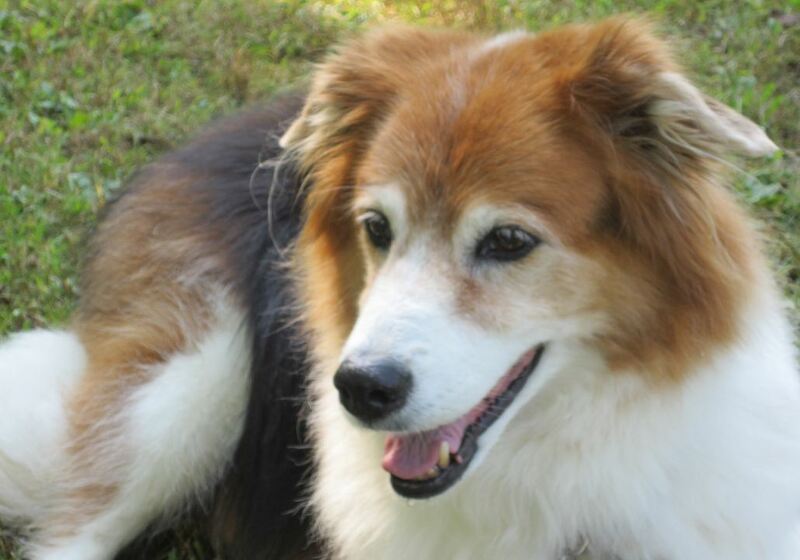 she came over the Rainbow Bridge simply because of old age. However, she felt neglected by her family as the senior dog, because they had her for many years then they got a puppy and then a few years later, another puppy. Soon, they did not play with her as much and she was kind of left to be on her own. I know that you have a soft spot in your heart for seniors and that is why you adopted ME!! Sadly though, many people don’t think like you do. Cuddles was not harmed in any way but she just wasn’t loved like she was when she was first adopted as a puppy. Some people want the “puppy” experience and then they tire of it. 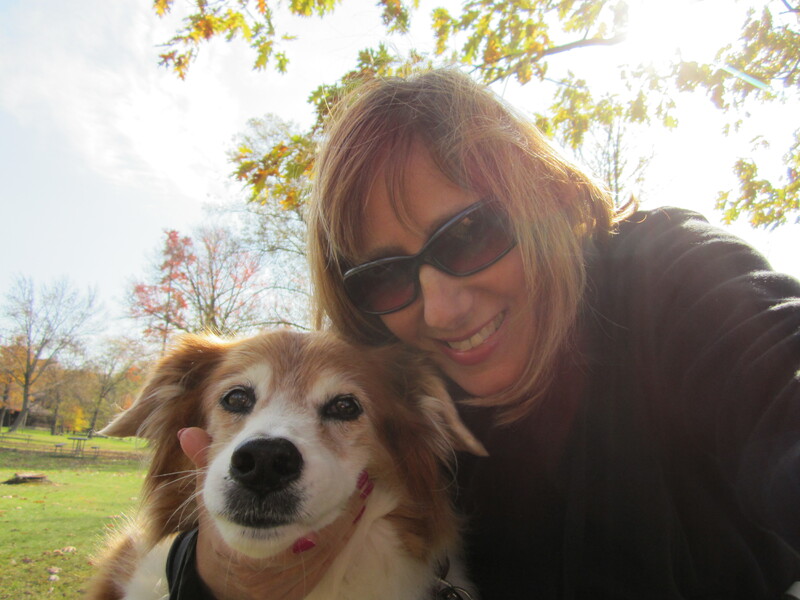 Cuddles, like so many of the folks taking the new Finding Joy class, have had that experience and it makes me sad. I think that when people adopt a cat, a dog, a horse or any animal companion, they should give their very best to them, like you did and all your friends do. In turn, we should expect the best in life and then I think we get it. If we think we are not deserving of it, then maybe we will not have that experience. When I looked for a dog for you guys, I wanted you to have the best dog. That does not mean she is a perfect dog – none of us are perfect! It just means that she is the best dog for you at this time in your life. From what you have told me and from what I have seen, I think I accomplished my goal with great success! Joy is an interesting soul. She is going to be very interesting to watch grow up. I think she is doing amazing taking in account the horrors she has been through in her puppy-hood. She is safe with you and so loved. She expects the VERY best, the little princess that she is! I find that so miraculous since she never received the best until she went to Indian Summers. As Dr. Victoria has said, even that is not a real home. It’s a safe haven, yes. But now she is where she belongs. That is what I mean. I think people can apply this thinking too! Maybe life has not always been perfect, but there is always a chance to make it brighter. If you are the best and demand the best from others, you shall receive it in return and that is what I am doing here in Hyfryd with my classes. I know you are proud! So that is my letter for today. You taught me so much about love Mommy, maybe you are not even aware of that, but you did. You are the best and so am I and that is why WE were a team and will always be one! Love forever and ever – Your Sweet Bailey Girl! WRITE ME SOON!!!!!!!!!!!! PS: OF COURSE I RUSTELED THE TREE! !